I did something new yet again! 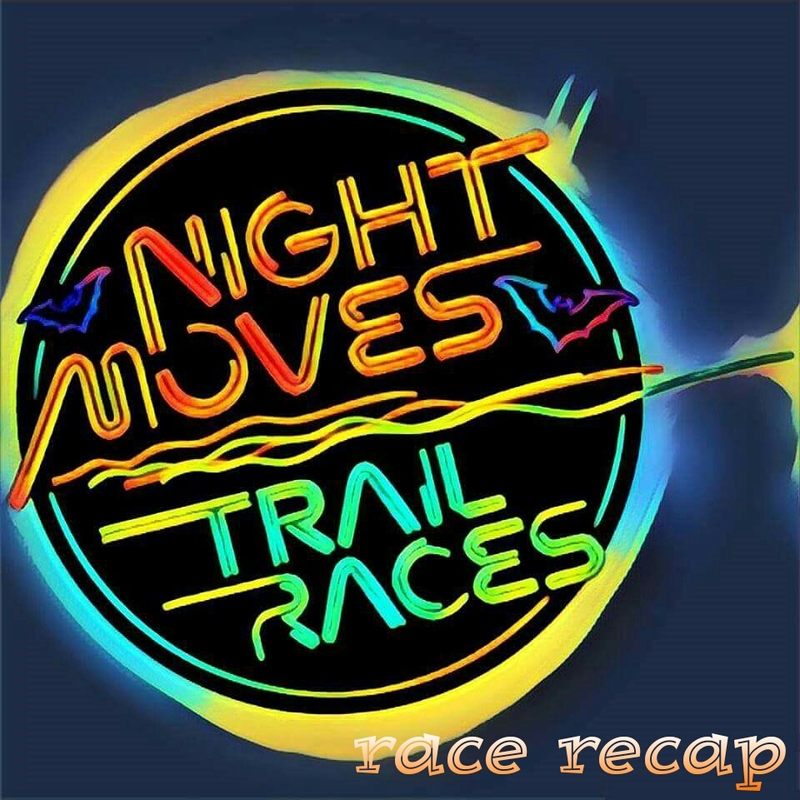 I ran a trail race AT NIGHT! This was the Night Moves Trail Race. 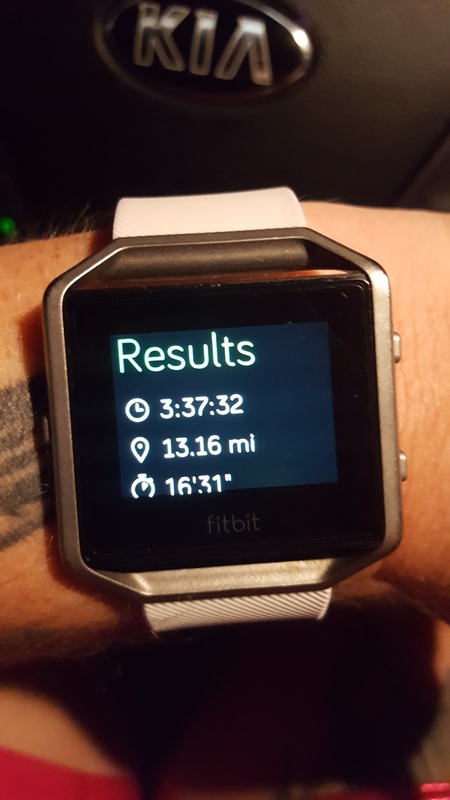 It included a 5K, 10K, half (what I did), and a full marathon. 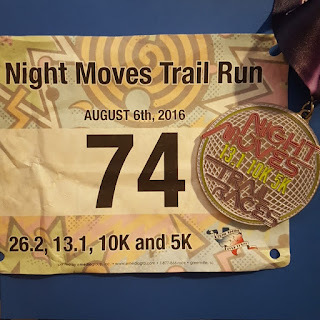 This race was put on by the same people that put on the other 2 trail races I’ve done, Trail Racing Over Texas (TROT). They’re based out of Houston, TX, so most of their races are closer to Houston, but they have them all over the state. 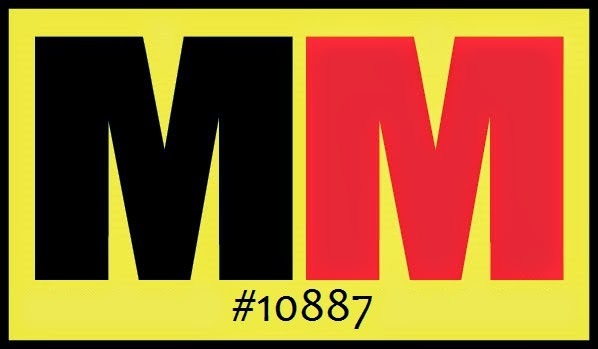 One of their races I really want to do is the Franklin Mountains Ultra (I’d do “just” the 50K…haha). Anyway, totally off topic there. 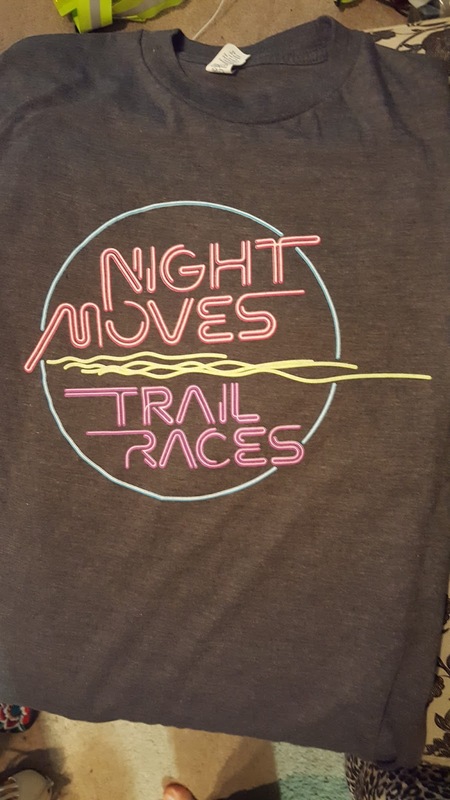 I’m very glad that TROT does packet pickup right before their races on top of the regular packet pickups at a local running store the day before the race because I usually have to drive a few hours to get to their races. If they only offered pre-race day packet pickup, I’d have to get a hotel room because I’m not driving to Houston just to pick up a packet one day and then again the next day for the race. San Antonio, yes, Houston, no. So, packet pickup was super easy and fast. I got my bib and my shirt and headed back to my car to hang out until it was closer to the start time. When I made my way back to the start area, I noticed a lady wearing the exact same INKnBURN singlet as me (Zen! 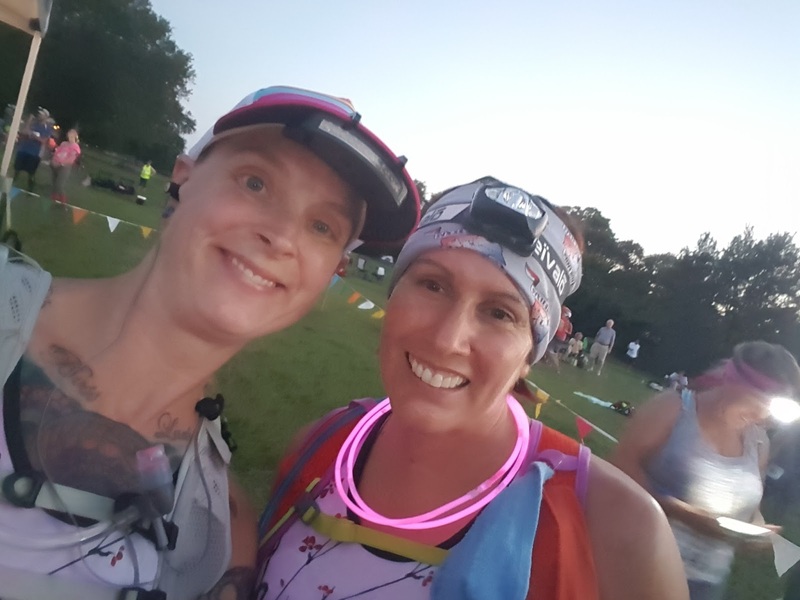 ), a pink tutu (I was wearing a pink sparkling skirt…was actually going to wear a pink tutu, but forgot it in my rush), aaaaaaand, she also has the Garmin 920 in red and white! We were accidental twinsies. Her name was Tammy and I hung out with her and her friend (who had to sit the race out because she was in a walking boot). 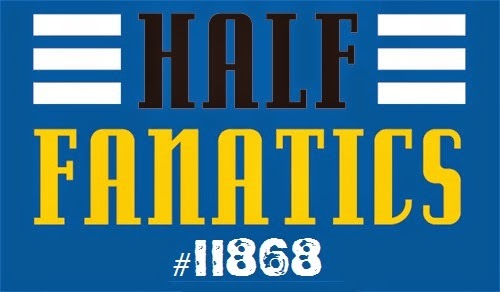 The race kicked off at exactly 8:30pm. We ran down the park road for a couple tenths of a mile before hitting the trails. The trails here are actually mountain bike trails, so they’re a little…rough and technical. 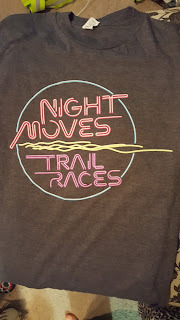 I wish I had gotten a hotel room or camped on site because I would have loved to have walked the trails before or after the race and taken pictures of what I was running thru so you guys could get an idea of just how technical it was. However, it probably looks way less “ominous” in the daylight than it did at night. The first 2 loops were about 5 miles and the third loops was about 5K. 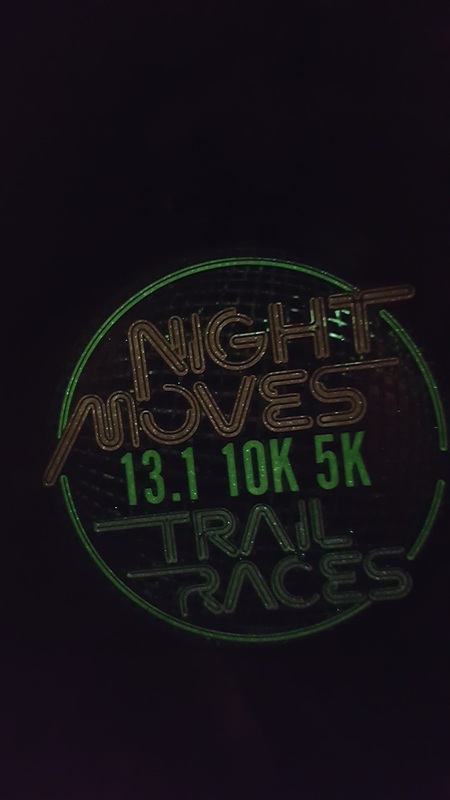 On the first loop, we were in a huge mass of people (or as huge a mass of people as you can be on a single track trail) and with everyone’s headlamps, knuckle lights, etc lights bouncing and bobbing all over the place, it was a little hard to see. I tripped a LOT on the first lap until we all spaced out into single runners and smaller groups of runners. About halfway through the first lap, I hung out with 3 ladies for a bit…Michelle, Kristy (it was her 35th birthday…HAPPY BIRTHDAY!!!) and BobbyJo (I may be wrong and her name is BillyJo…if you’re reading this, I’m sorry I don’t remember your name correctly!). They were very nice, but wanted to stop and take pictures at this ridiculous bike jump. I don’t blame them. Part of me wanted to do the same thing. So I pushed on and went solo. By the end of the first lap I was completely soaked. This race was in the Jack Brooks Park just outside of Galveston, TX. That’s pretty much right at the coast of the Gulf of México, so the humidity was crazy. I could see it in my visor light right in front of me! Salty humidity for the win! Haha. Not so much. But other than being completely soaked, the humidity really didn’t seem to bother me. Probably because, like with any trail race, you walk a fair amount. So, maybe it did because a couple times I stopped to walk was because I needed to catch my breath. I do love hills (no, seriously, I do…not joking!) and so I made sure to power up like 97% of the hills. Even if I was taking a walk break, I would run up the hills. And, on the opposite end of the spectrum, I was very careful with the downhills. At about mile 8.25, I did fall. Thankfully it was an uphill fall so it wasn’t so bad. Just a small scrape on my knee and dirt all over my super sweat soaked hands. Oh, the humidity was so salty that I had a layer of salt on the outside side of my hands! Like, I could scrape it off with my fingernails! The last lap, there was about 1.3 miles remaining and another lady came up behind me and asked how much longer we had. She said her watch said about 1.3 but wanted to make sure. I confirmed her watch and mine said the same. 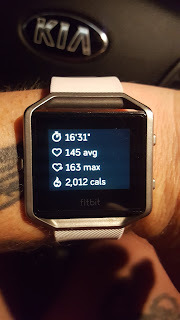 Well, my FitBit said the same thing. My Garmin was ½ a mile behind. I knew this previously, but had forgotten, but Garmins don’t do well with lots of zigzagging. However, my FitBit Blaze, which uses the GPS signal on my phone apparently does a little better and seemed to be pretty accurate. Anyway, this young lady (we didn’t exchange names) and I ran/walked the final 1.3 miles together and crossed the finish line together. As we crossed, Rob called out “bib 74 and 134, straight from the pool!” HAHA! We were seriously soaked. 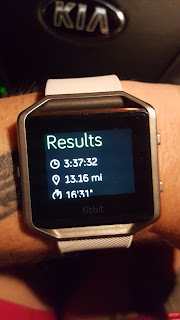 Overall, this was a fantastic race and if I decide to afford it next year (as I’ve decided to cut back on my races next year for financial reason…sad, I know…I love running races so much), then I will definitely be running this race again next year. While it was lots of fun, I was sooooo glad I was NOT running the marathon distance. My back and neck were cramping from having to look down so much so I could see what was right in front of me (I think a headlamp strapped around my waist for the next time might be a fabulous idea…Tammy did this! Or a set of knuckle lights…either way, I need something else besides just the visor light). 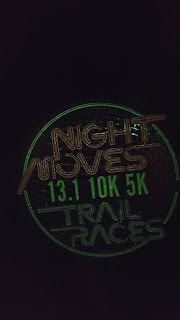 The medal is pretty cool and glows in the dark. I came in 5th in my age group (10 year spread, 17 total females in my age group) and 44th overall (out of 101 participants in the half). 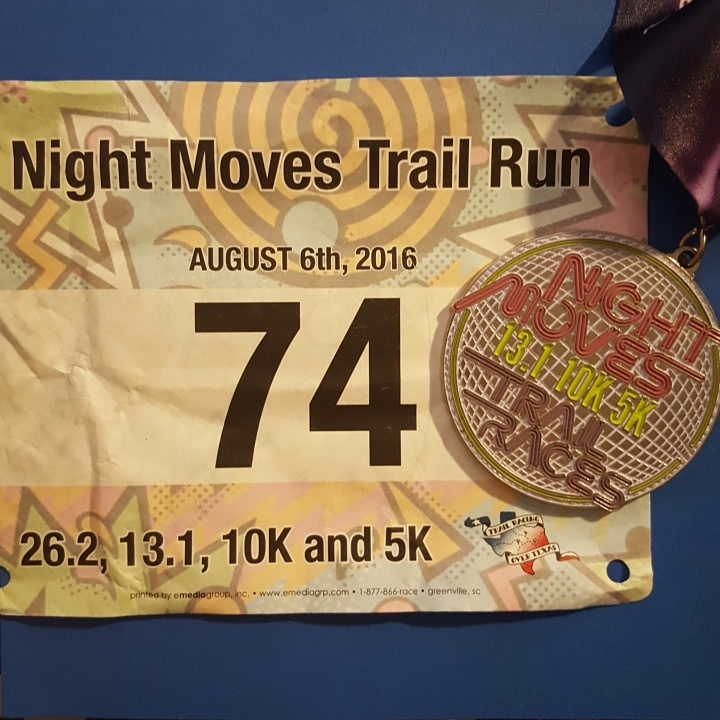 Pretty decent stats for someone who’s never run a night time trail half marathon before! I’m happy with it! I even got mention in the “Top Performances!” I was apparently 9th female overall. 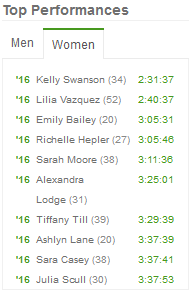 And based on this, the lady I ran the last 1.3 miles with was named Ashlyn. So, Ashlyn, if you’re reading this great job!